REVENUE OFFICERS HAVE seized alcohol worth more than €106,000 at Dublin Port. The discovery of the 24,000 litres of beer was made by officers yesterday during routine profiling at the port. They stopped and searched a foreign-registered truck that had disembarked a ferry from Liverpool. The driver, a man in his 50s from the UK, was questioned and both the trailer and the smuggled beer were seized. Revenue said the beer, with a retail value of over €106,000 represented a potential loss to the Exchequer of over €57,500. Investigations are ongoing with a view to prosecute. Revenue said this seizure is part of its ongoing operations to target the supply and sale of illegal alcohol in the shadow economy. 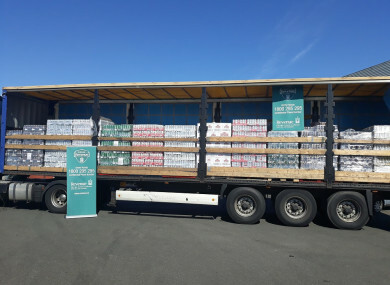 Since the start of this year, officers at Dublin Port have made over 420 seizures of consignments of smuggled alcohol. If businesses or members of the public have any information regarding the smuggling or sale of illegal alcohol, they are asked to contact Revenue in confidence on 1800 295 295. Email “Revenue seizes 24,000 litres of beer at Dublin Port”. Feedback on “Revenue seizes 24,000 litres of beer at Dublin Port”.